Copper 5 Kopeks of Catherine I. 1727. Reference: K-165, 170 & 179 (with different mint marks). Silver 10 Kopeks of Catherine I. 1726-27. 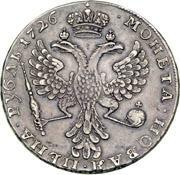 Silver 25 Kopeks of Catherine I. 1726. Silver Poltina (50 kopeks) of Catherine I. 1726. 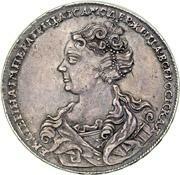 Obverse: Bust of Catherine I. 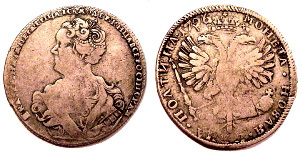 Silver Poltina (50 kopeks) of Catherine I. 1726-27. Silver Ruble of Catherine I. 1725. Silver Ruble of Catherine I. 1725-26. Silver Ruble of Catherine I. 1726-27. Gold 2 Rubles of Catherine I. 1726-27.